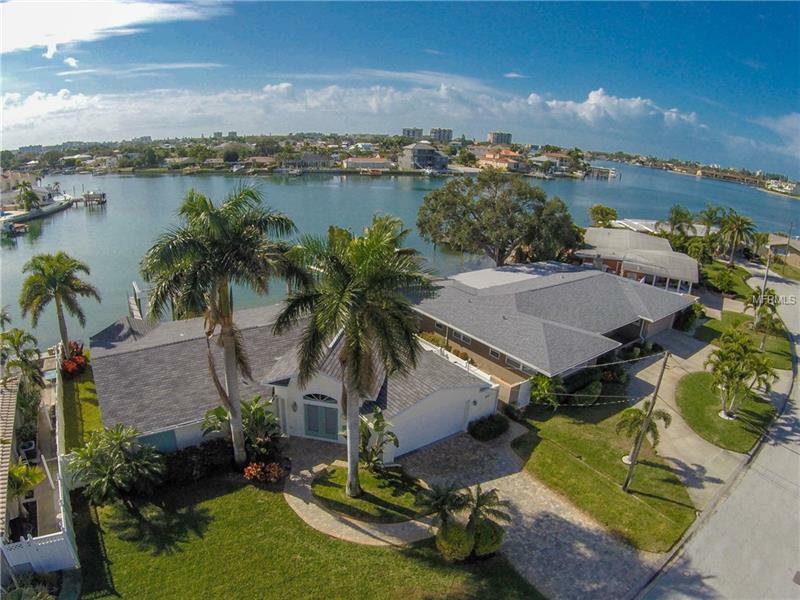 Stunning water views await you from this south facing water front designer home in Causeway Isles. One of St Petersburg's most unique & sought after locations is available now. This spacious 3 bedroom, 2.5 bath, 2066 sq foot stylish residence delivers bright open spaces, and intracoastal views. As you arrive, you will notice fine landscaping, pavered driveway & a modern entryway onto a great room with spectacular views. This remodeled home features an impressive kitchen with ample storage space, solid wood cabinetry, pull outs, high end appliances, & gorgeous granite surfaces. Living and dining space is bright, open & designed around the amazing view. Enjoy dinner next to your waterfront pool, catch a sunset from your lushly landscaped yard, enjoy a quiet afternoon on you expansive pavered deck overlooking the water. The spacious waterside master suite features a modern bath retreat with jetted tub, walk-in shower, & double closets. Step outside through your double pane sliders to a stunning backyard featuring a saltwater heated Pebbletec pool & spillover spa, oversized double walkway composite dock with lift over deep water, and plenty of room for your water toys. This is an outstanding home & boating community, close to the beach, groceries, shoppes, parks, restaurants, & a very short boat ride to the Gulf of Mexico. Only 20 minutes to downtown St Pete and 30 min to Tampa International airport. Amazing value. Call for a private showing today.